Anusara Yoga is a community-based modern style of hatha yoga that combines the life -affirming and life-enhancing Tantric philosophy of intrinsic goodness with clear, precise alignment principles. Tantric philosophy sees life as a divine gift and celebrates, rather than condemns, the physical body. Anusara Yoga’s premise is that each of us is essentially good and that life is good. Anusara literally means flowing with Grace, and we flow with grace by saying “yes” to the whole magical spectrum of life around us and inside us. In the practice of Anusara yoga, we accept the world and ourselves as we are – the light & the dark, the full rainbow of emotion & thought - then respond with love. We open our hearts and say yes to life. 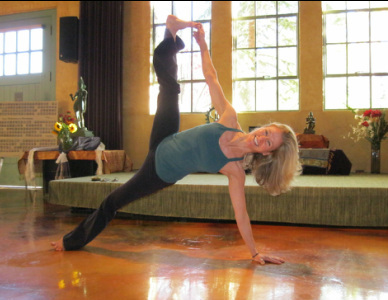 Click here to see Anusara Yoga's Universal Principles of Alignment & Seven Loops. All Anusara yoga classes open with the singing of the Anusara Invocation in the ancient Sanskrit language. Anusara Yoga's founder, John Friend, received this invocation from one of his teachers, Gurumayi Chidvilasananda. This mantra is found in a sacred Sanskrit text known as the Niralamba Upanishad. Go to the Anusara Yoga website for a more direct translation of this ancient mantra, or explore the internet for a plethora of beautiful translations. I have spent a lot of time with this invocation and been so inspired by it. This is my personal translation. And that, without any effort on our part, we always have a light of inherent goodness and beauty shining within us.